Targets are to be set to reduce calories in pizzas, burgers and ready meals as part of the government's drive to tackle child obesity in England. Health officials believe the move is needed as people are consuming 200 to 300 calories too many each day. It could see the size of products reduced or ingredients changed in food and drinks bought in supermarkets, takeaways and restaurants. The targets are expected to be set by Public Health England within a year. They will be voluntary, although officials at the government advisory body said if the industry did not respond they were prepared to legislate. The calorie-reduction programme comes after the success of the decade-long drive to reduce salt content in food. It will be modelled on the sugar-reduction programme that was included in last year's child obesity strategy and which committed the industry to reducing the amount of sugar in certain foods by 20% by 2020. PHE chief nutritionist Dr Alison Tedstone said good progress was being made on the sugar target and it was now time to consider tackling calories. She pointed out that only a quarter of calories come from sugary foods so if successful it could have a major impact. "We have a serious problem - one in three leave primary school either obese or overweight," she said. 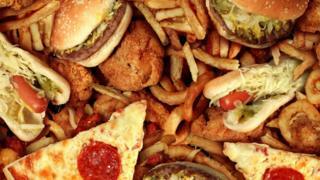 "If we want to tackle this we have to look at calories. There are a number of ways it can be done - we can reduce the size of the products or change the ingredients." She also defended the child obesity strategy, which was announced last August, amid criticism from campaigners that it had failed to have the impact it should have. Dr Tedstone said she was "delighted" with it as it was the first time there had been a cross-government commitment to tackling the issue. The plan also included the levy on sugary drinks, which is due to come into force in April 2018. Caroline Cerny, of the Obesity Health Alliance, said it looked forward to seeing "ambitious" targets being set to cut calories. But she said the food industry was continuing to "get away with bombarding children with adverts that we know encourage unhealthy food choices". "Failing to tackle this area is significantly undermining the impact of the child obesity plan. After one year, it is scraping along with a C grade, rather than topping the class with an A star," she added. A spokeswoman for the Food and Drink Federation said it welcomed "broadening" the focus away from only sugar. "Singling out the role of individual ingredients and food groups does not help consumers to make good choices about their diet, lifestyle or general health." She said companies were playing their part by making healthier options available and providing nutritional information on packs. She added: "Our industry has a proud track record of reformulation to remove salt, fat and sugar from food and drinks. This work will continue as we rise to the challenge of PHE's sugar reduction targets and engage with this new focus on calories." Whatever happened to the obesity strategy?